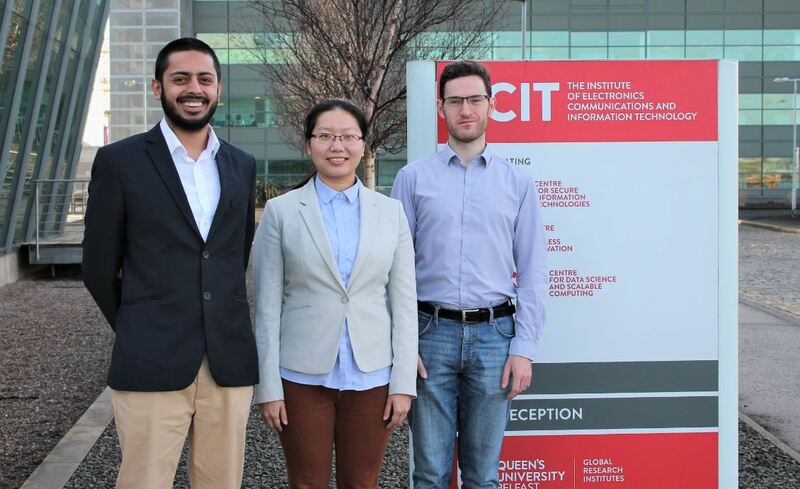 Three researchers from the Institute of Electronics, Communications and Information Technology (ECIT) at Queen’s have been shortlisted as finalists in the esteemed Mobile World Scholar Challenge, an international competition that showcases the best mobile research taking place around the world. Dozens of applications from universities across the world were submitted during the two-month application period, and five finalists were chosen by GSMA (Groupe Spéciale Mobile Association), the trade body that represents the interests of mobile network operators worldwide. The three finalists from ECIT are Muhammad Ali Babar Abbasi (pictured left above), Nan Wang (centre) and Dr Niall McLaughlin (right). Their research spans a variety of complex subjects within the mobile industry such as Deep Learning for Mobile Malware Detection, Multi-Access Edge Computing, and 5G Network infrastructure. Postgraduate Research Student Nan Wang said: “It is an honour for my research to be recognised by the esteemed GSMA. My work is focused on Edge Computing and ECIT is leading the way in ensuring the adoption of this new technology. The finals of the competition will take place at MWC19 in Barcelona, Spain on 27 February 2019. MWC19 is the largest gathering for the mobile industry in the world, bringing together the latest innovations and leading-edge technology from more than 2,400 companies and over 100,000 delegates. The event showcases cutting-edge ideas poised to impact the mobile world. The Mobile World Scholar Challenge forms part of the event and highlights new and impactful ideas from the academic and research communities across the globe.